"The most powerful thing is making that choice to care," says Oelrich. Ryan Oelrich will never forget the people who chose to care. The ones who didn't know the whole story, who didn't have the credentials, but who still supported him when he was in his darkest place. When he was 9, Oelrich was abused at the hands of a stranger. Then, as a gay teen, he was told by religious leaders that if he couldn't change, he shouldn't even exist. If not for a few important relationships, he might have chosen the latter. "It was thanks to the support and love of my parents, and a couple other individuals who chose to care, that I made it," Oelrich says. Oelrich has since devoted his life to two causes: uniting the community and helping at-risk kids. He is the executive director of Priority Spokane, an organization that aims to stabilize the lives of homeless families. 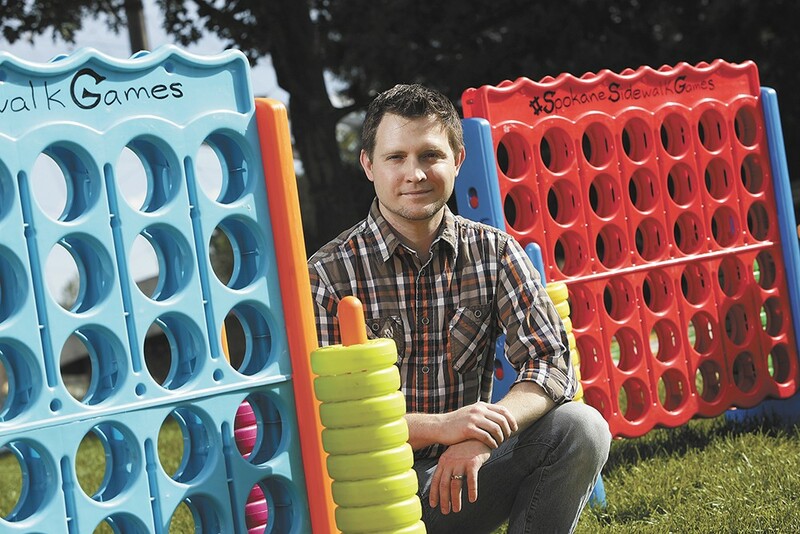 He also recently started Spokane Sidewalk Games, a project staffed by homeless kids that brings strangers together to play giant versions of games like checkers or tic-tac-toe. He is now the one who chooses to care, even though he doesn't always have to. For Oelrich, the problems society is facing — violence, political dysfunction, poverty, homelessness — all relate back to the need for people to connect more. He says that people don't take the time to hear each other's stories, to talk to each other, and that in turn makes people fearful and isolates groups of people. "And so, my passion right now is, truly, how do we reconnect people?" Oelrich says. Oelrich, as an "Air Force brat," lived all over the country as his father constantly moved. He spent the biggest chunk of his childhood in Helena, Montana. The church is one place where he saw the value of service and generosity to others. He learned selflessness in large part from his father. He remembers his dad, in full uniform, getting ready to leave for work but getting a call from a woman with five kids in a run-down trailer who wanted help unclogging the toilet. His father went into the filthy trailer, got on his hands and knees, and unplugged the toilet. "I'll remember that for as long as I live. I remember thinking, why would my dad do this?" Oelrich says. Oelrich started college at Whitworth University, staying there for one year before finishing his education at Gonzaga. More than a decade ago, he was caught up in a scandal involving former Spokane Mayor Jim West, who sought out Oelrich in a gay chat room. Oelrich then spoke out publicly about the experience of meeting West, and being sexually harassed by the mayor. Afterward, he remembers having food thrown at him and being spat upon by people who recognized him. "It was just this bizarre situation where I really tried to do the right thing, and then I realized that in some situations there isn't really a right thing," Oelrich says. Today, Oelrich's work in the community has far eclipsed anything in his past. He ran a nonprofit youth group for gay youth for several years, he has started programs to support at-risk youth, and he volunteers for Epilepsy Foundation Northwest. He is chair of the Spokane Homeless Coalition and is on the board of directors for the Terrain arts organization. Lyndia Wilson, director of the Spokane Regional Health District, hired Oelrich as executive director of Priority Spokane in February of 2015. "I admire him for his work in the community," Wilson says. "He just continues to give back to the community and be involved." This year, he invited teens living at the Crosswalk shelter to work for him as Spokane Sidewalk Games staff. Bridget Cannon, who works at Crosswalk as the director of youth services for Volunteers of America in Eastern Washington, says Oelrich is extremely passionate in helping vulnerable youth. "If you look up the definition of 'passionate,' I think his picture would be in the dictionary," she says. Cannon says Oelrich knows the kids don't need more friends, but healthy adults to look up to; Oelrich is one of them. If a problem arises, Oelrich is always looking for new solutions. "He offers a flexible and nimble mind," she says. "If that path isn't gonna work, [he says] 'let's look from a different angle, turn it upside down and look at what needs to be happening, where's the gap, and what will work.' There aren't a lot of closed doors for Ryan." Oelrich says he's determined to build a community in Spokane. He says he wants to prove wrong the people who spat on him and said nasty things. He is motivated by creativity, and by relationships. That includes the community, and each individual kid he is able to help. Positions: Executive Director of Priority Spokane; Project Coordinator, Spokane Sidewalk Games; Epilepsy Foundation Northwest Spokane Representative; Chair of Inland Center for Strategic Integrity; Chair of Spokane Homeless Coalition. I give back because... I have something to give, and nothing's going to get better unless people step up.I look up to... A growing army of passionate Spokane volunteers, artists, and community leaders who each have chosen to care and collaborate.I wish that... More people would courageously step out, step up, and take ownership of their community. I look up to... A growing army of passionate Spokane volunteers, artists, and community leaders who each have chosen to care and collaborate. I wish that... More people would courageously step out, step up, and take ownership of their community.